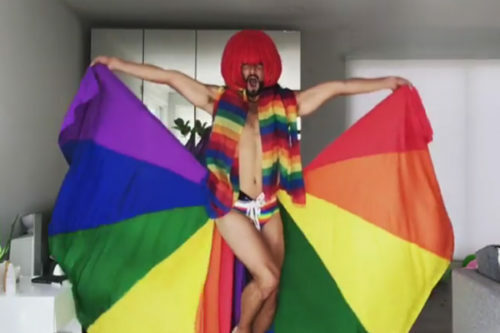 When Mark Kanemura decided to celebrate pride for his #CutTotheFeelingFriday post series on Twitter, he decided to go all out. It wasn’t his first incredible performance — his Twitter, Facebook, and Instagram accounts are littered with such — nor even the first for him this pride month: his first such post had him wrapped in a black tarp, revealing his rainbow colored gear with a flourish that also unveiled dozens of balloons hidden under the tarp. Two weeks later, he topped himself with an even more elaborate show in, once again in his bedroom. It is one best seen to be believed. The post has gained over 493,000 views on his Instagram account, and a staggering 2.22 million views on Twitter. Kanemura is no stranger to performing, having served as a dancer for Lady Gaga as well as appearing on Dancing With The Stars, The Ellen DeGeneres Show, American Idol, and even ending up as a finalist on So You Think You Can Dance. On the latter, Kanemura led a RuPaul inspired show to the song “Call Me Mother” in August of 2017. Given how the wig reveal has been a trademark move on RuPaul’s Drag Race since season one — and has a long drag history long before the show — it would seem clear where Kanemura may have picked it up. Yet not even the most iconic wig reveals on Drag Race can hold a candle to Kanemura’s. It may be the perfect moment of joy for your pride month: hilarious, campy, and fun!